In this article you’ll discover five Facebook advertising tools that save you time and boost your return on investment (ROI). 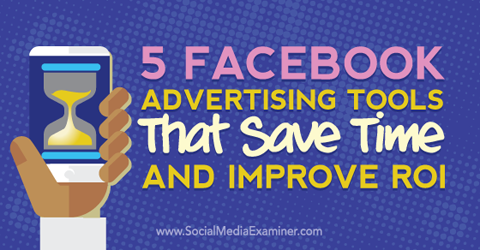 Discover five Facebook advertising tools that save time and improv ROI. Facebook has offered Ads Manager for mobile devices since 2014, but earlier this year they launched a stand-alone iOS Ads Manager app with some pretty necessary features for advertisers. Now you can track ad performance, edit existing ads, revise ad budgets and schedules, receive push notifications and create ads from the app. The Facebook Ads Manager app enables you to manage ad campaigns on the go. Image: Placeit. It was nice to be able to manage ads with the first iteration of the mobile manager, but the stand-alone app is more convenient and powerful. It’s designed for small- to medium-sized advertisers and allows you to create ads from your existing page posts or from images and photos on your device. If you’re using Android, you’ll be happy to know a version will be released later this year. Facebook continues to add more precise targeting options to their ad platform, making it possible to market to incredibly granular groups, right down to specific individuals. Often though, it’s beneficial to exclude certain segments to get your ads in front of the right audience. 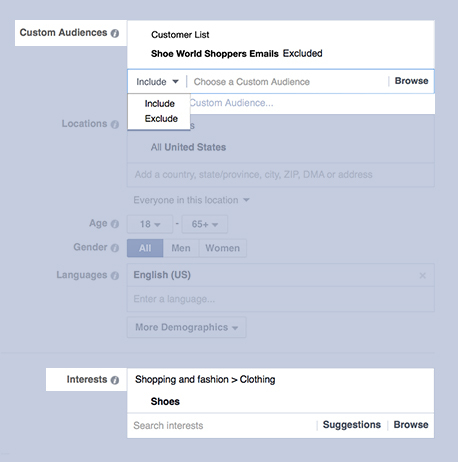 Exclude a certain audience from seeing your Facebook ad to improve your targeting. Enter Facebook’s Exclusion Targeting, a tool launched to help you avoid targeting the same people twice. 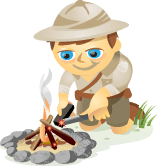 For example, you can exclude your existing customers from a promotion designed to generate new leads. Or target your website visitors (as a custom audience), but exclude those who’ve already converted. Facebook promises that exclusion targeting can help you lower your cost per action or cost per click, reduce money spent on wasted clicks and reach people who are more likely to buy or convert. It works with regular Facebook ads, as well as the newer (and awesome) carousel ad format on both desktop and mobile. Sure, you can split test Facebook ads on your own, but if you’re attempting to glean useful insights from it on any scale, you’re going to want a tool to automate the process. Qwaya is a paid tool with a ton of features including ad scheduling, performance-based rule setting, autorotation of ads and a campaign organizer. 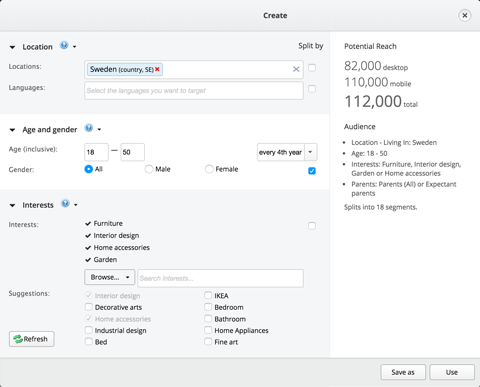 But one of its best features is its ability to automate split testing (A/B testing) for both creatives and audiences. Qwaya lets you automate A/B testing for your Facebook Ads. If you’re already using Facebook Power Editor, you know that the ability to split test audiences, as shown above, is sorely lacking. Qwaya also helps you determine which combinations of imagery, text and targeting make up the best-performing ads with its split testing feature. 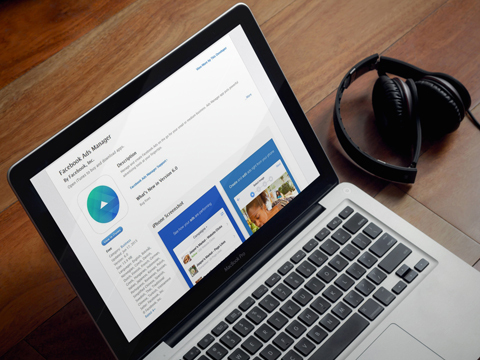 AdEspresso’s Facebook Ads Compass is like a report card for your Facebook ads account. If you’re agency-side, don’t worry; it lets you choose which account and which campaigns you’d like to analyze so you don’t get a mass of information for all of your accounts together. 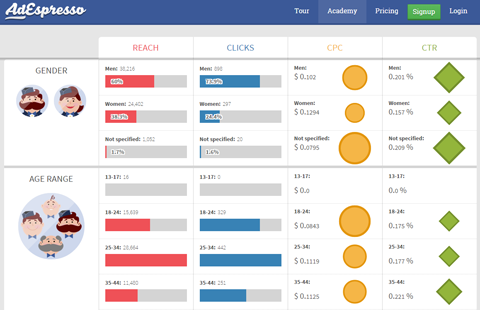 Facebook Ads Compass analyzes the performance of your Facebook ad campaigns and benchmarks them against others in your industry. If you’re already using a tool to analyze your ads’ performance, the Compass report might seem redundant. But it’s a great starting place if you’re a small business and have been doing the bulk of your Facebook ads optimization based on manual analysis. You have to factor in your time spent managing your Facebook campaigns into overall ROI, so a tool like this can help you save time and enhance performance (if you act on its recommendations!). AdEspresso has analyzed over $290 million in Facebook ad spend to create industry benchmarks against which your campaigns are compared in the Compass report. It’s a great way to see how you stack up against other businesses in your industry. Hootsuite recently announced they were partnering with Facebook to offer you a way to automatically generate Facebook ads, based on your existing organic page posts. 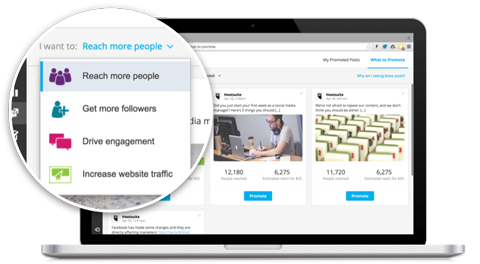 After you choose a goal for your ad, Hootsuite Ads will find your best-performing posts and promote them to help you achieve your goal. Hootsuite Ads scans your Facebook page to find the best ads to promote, and then applies automated targeting and a bidding algorithm to launch them as ads (promoted posts). Hootsuite says this product (which is currently in beta) will turn even an advertising rookie into a social ads expert, but I wouldn’t go that far. In general, it’s still a best practice to understand the basics and have a good grasp of what the software you’re using is doing and why, even if it’s automating some of the work for you. With that said, you’re already putting time and effort into creating visuals and messaging for your page, so it may make sense to have your best material automatically converted into ads. Test it out and see if the ROI makes it work for you. Facebook ads, once almost universally dismissed as low intent and not nearly as valuable as Google AdWords, are now a massive market, to the tune of $3.3 billion in revenue in Q1 2015. New ad formats, with a greater emphasis on native/in-stream and super-precise targeting options, have made Facebook ads a valuable addition to any digital marketer’s arsenal. With the Facebook advertising tools in this article, you can automate processes, perform A/B testing, target with more precision and generate awesome ad creative. Some are free, others are paid, but each one is worth checking out. What do you think? Do you have a favorite tool for Facebook ads? Please share your thoughts in the comments below. Facebook Ads Manager app image created with Placeit. 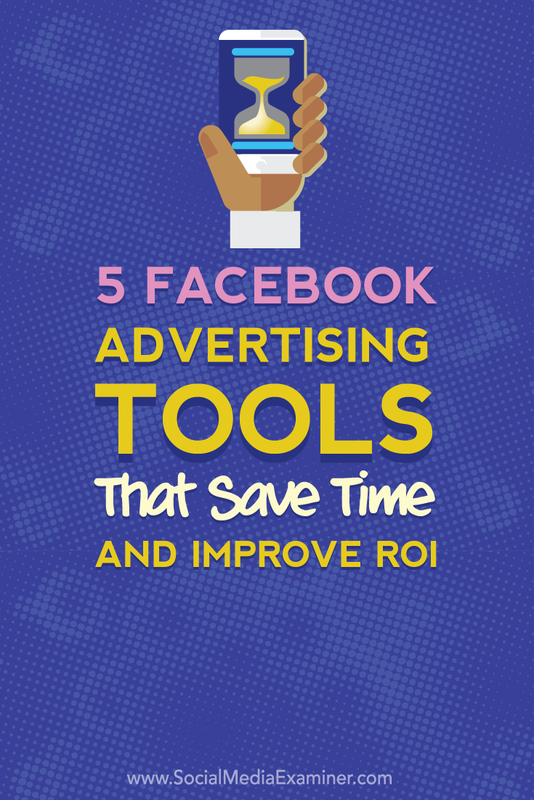 Tips for saving time and improving ROI with five Facebook advertising tools.